Once upon a time an old man and woman lived in a village. 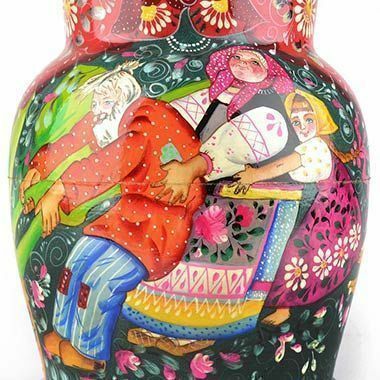 One day the old man said to the old woman: "Grandmother, go scrape in the flour-tin and sweep in the corn bin, perhaps you will get enough flour to make a Kolobok." The old woman went off and scraped round the flour-tin and swept the bottom of the corn-bin and she got a couple of handfuls of flour. Once upon a time there lived an old man who had three sons, two of them clever young men and the third, Emelya, a fool. The two elder brothers were always at work, while Emelya lay on the stove ledge all day long with not a care in the world. "Go and fetch some water, Emelya." "Not I. I don’t want to." Once upon a time a magician made a magic mirror. In this mirror, a kind face became wicked; a look of hate was reflected as a look of love. One day, however, the mirror broke, and if a sliver of glass from the mirror entered someone’s eye, that person’s soul became evil, if another pierced a heart, that heart grew hard and cold as ice. Once upon a time an old man, a widower, lived alone in a hut with his daughter Natasha. Very merry the two of them were together, and they used to smile at each other over a table piled with bread and jam, and play peek-a-boo, first this side of the samovar, and then that. Everything went well, until the old man took it into his head to marry again. Once upon a time in a far away land, a merchant was preparing to set out on a long journey. This merchant had three daughters, and he asked all of them what they would like as gifts for themselves when he returned from his voyage. The first daughter requested a golden crown, and the second one wanted a crystal mirror. The third daughter asked only for "the little scarlet flower." Long ago in a faraway kingdom, three sisters were sitting on the bench in front of their house in the courtyard talking, imagining what they would do if they were married to Tsar Saltan. One said that she would prepare a great feast for the entire world. The next said that she would weave linen for the entire world. The third said that she would give the tsar "an heir, handsome and brave beyond compare." Once there lived an old man and his wife, and they had a daughter named Alyonushka and a son named Ivanushka. The old man and the old woman died, and Alyonushka and Ivanushka were left all alone in the world. Many years ago there lived an old widower and his pretty, diligent daughter Nastenka. With time, the man married a second time to a woman, who had her own nasty and lazy daughter, named Marfa. The woman doted upon Marfa, praised her at any opportunity, and she despised and hated her stepdaughter. Nastya had to work hard every day, and nevertheless her stepmother was always unsatisfied and made her work more and more. Two or three hundred years ago in some kingdom there lived a Tsar who had three sons. One day the Tsar called his sons and said, "My children, all of you have grown up to a manhood. It is time to think about marriages. Each of you should shoot an arrow as far as you can. The girl who catches your arrow will be your bride whom you will marry." A very long ago in one village there lived an old miller with his three sons. When he felt his death coming, he left to his sons a heritage: The mill fell to the elder brother’s lot, a donkey came down to the middle brother, and the youngest brother inherited a cat. Once upon a time there lived Grandma and a Grandpa. They were very poor, and often went hungry. One of their few earthly belongings was a hen, which laid very few eggs. One day the hen laid a golden egg. Grandpa set it on the table and called his wife. They discussed what they should do with the egg. Grandpa thought that if they took it to the tsar they might be honored as nobles and given some land. Then, the Grandpa called the Grandma, his wife, to help him to pull out the Turnip. Then the Grandma called their Granddaughter for help. Once upon a time, there lived a man and his wife. They had a daughter and a little son. One day the mother said to her daughter: "Darling, your father and I are going to work. Take care of your brother, keep an eye on him and don’t leave the house. Be a good girl and we will bring you a present." In a certain kingdom, in a thrice-ten realm that lay far away, beyond the thrice-nine lands, there once lived a mighty king. The king had an archer who was as brave as he was strong, and the archer had a horse that was as strong as it was fleet of foot. One day the archer got on his horse and rode off to the forest to hunt. Once upon a time there lived an old man and woman who had a granddaughter named Masha. One day some friends of Masha’s decided to go to the forest to gather mushrooms and berries and they came to Masha’s house to ask her to go with them. 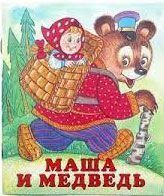 "Please, Granny and Grandpa," said Masha, "do let me go to the forest." "You may go but see that you keep close to the others and do not lose sight of them or you might get lost," the two old people replied.